The Scott Frost era is out and the Josh Heupel era is in. 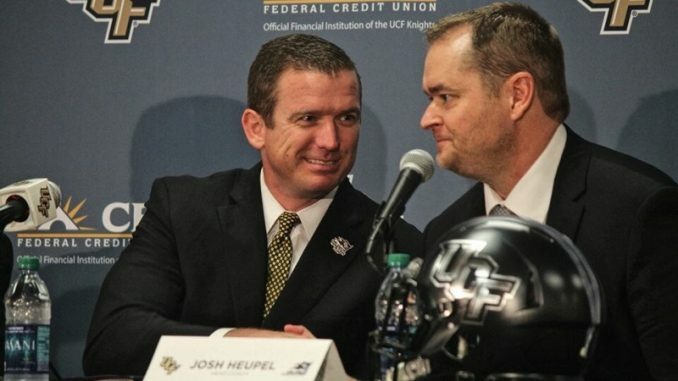 UCF moved quickly in its latest coaching search, as athletic director Danny White named Heupel the new coach less than four days after Frost officially announced that he was leaving for Nebraska. Heupel, who comes to Orlando after spending two seasons as the offensive coordinator at Missouri, said accepting the position with the Knights means he is fulfilling a “lifelong dream.” He earned a degree in business marketing from the University of Oklahoma, but that was what he considered his backup plan. Plan No. 1 was always to be a head football coach. Why? It runs in the family. The 39-year-old is the 11th head coach in program history. While interim coach Troy Walters and the former staff are the ones preparing the No. 12 Knights for their upcoming Peach Bowl matchup with No. 7 Auburn, Heupel said he will be in the stadium to watch his new team on New Year’s Day. Below are some of the other highlights from his introductory press conference. Question: Have you had a chance to look at some of the pieces that will be returning for you on the offensive side of the ball with McKenzie Milton at quarterback and some of the running backs and wide receivers, and does that excite you? Q: Do you feel any pressure about taking over a 12-0 team? Q: Do you plan on retaining any of the current staff and what was the reaction from the players when you were introduced? Q: What does it mean to you to get this head coaching job? Q: What kind of offense do you plan on running?